4-in-1 Multifunctional Table This multifunctional game table comes with four games! Thanks to its i..
9-in-1 Multifunctional Table This game table is 9 times the fun! The playing surface can be switche..
Set up the game on the table and let the game begin. The disc glides easily across the field lifted ..
Who can do a "hole-in-one"? With this great golf game in pinball format made of wood, everything is .. 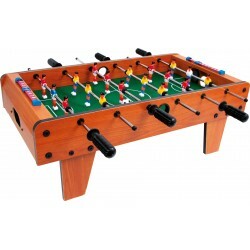 This table football is ideal for out and about. Four players can compete in a fast-paced game. The..
Metal pins have to be set on the varnished beechwood board, the ball has to be placed in the lane, l..
Every football fan will have fun while playing with this table football. Each team has 9 kickers who.. This little table football is an amusing activity and a playful training for the fine motor skills a..